California is known for its fresh, organic food. For our #48 recipe on this Adventure Of A Lifetime, we bring to you California Sushi For Dogs! If your dog has different, favorite vegetables or lean meats, feel free to experiment! Channel that inner dog chef and have fun! Pour rice, carrots, spinach and water in a pan. Bring to a boil and simmer until all water is absorbed. Remove from heat, fluff with fork, and let cool completely. Preheat your oven to 350 degrees and bake the salmon in a non-stick pan for 30 minutes. Remove from heat and let cool completely. Chop into small pieces. Take a cup and add rice and veggie mixture to bottom. 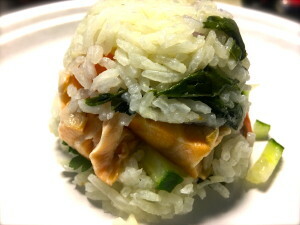 Add cucumber and herbs and salmon to the middle. Add more rice on top. Pat down, then flip onto plate! Repeat with remaining ingredients to make more sushi, or refrigerate to use for up to 3 days. This is meant as a treat and not a regular meal replacement. Always consult a vet before making any changes to your dog’s diet.